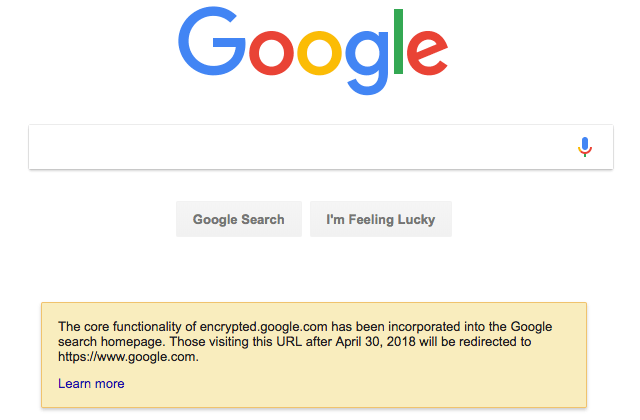 Google has posted a message on https://encrypted.google.com/ that this URL will redirect to the main Google home page after April 30, 2018. The reason is because the "core functionality of encrypted.google.com has been incorporated into the Google search homepage" they said. Which is true, almost all Google searches for encrypted with drives most analytics people wild (in an upset way). Again, this isn't a huge deal, since Google.com is encrypted and all the searches are encrypted anyway. The only reason Google launched that portal years ago was to give people a place to search that was encrypted but now that is all done anyway by default. Of course, just because it is encrypted doesn't mean that Google isn't storing your searches and data.